10 September: Whangarei Swapmeet and Car Display, AFFCO Building, Kioreroa Rd, 8am. 10 September: Classic and Japanese Bikes and Parts Swapmeet. 7:30am, Claudelands Showgrounds, Hamilton. Gate 1, Brooklynn Road East wing fully undercover. 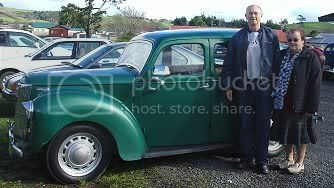 30 September: Manawatu VCC Manfield Swapmeet, Feilding. 21 October: National Die cast Models and old toys fair and Swapmeet, Northcote. 22 - 29 October: Dunlop Targa – Main Event. 27 - 29 October: City of Cycles Motorcycle Show, Telstra Clear Pacific Events Centre, Manakau City. 20 - 21 January 2007: Classic Car and Hot Rod Show Kumeu. 11 February 2007: Car, Bike and Machinery Show. 11am on the grassed area between Railway Hotel and Otaki Railway Station. Funds raised for Scouts and Guides. The usual winter weather a few showers but not enough to worry anyone. The assembly place for this run was the BP Service Centre on the Southern Motorway at Drury; a lot of car clubs make this their starting point. From there the cars proceeded to the first off ramp at Drury, and turned left to go through the industrial area at Drury, before turning into Bremner Road which took us across the motorway and to answer the second question: how old was the bridge. Along a little way we turned sharp left, into Jesmond Rd and another trick was to find the horseshoe, apparently we were the only ones that did. After this we traveled towards Ramarama and turned down Kerns Road. After traveling past small farms and answering more questions we eventually arrived at Tuakau and resisted the temptation of going into the big secondhand shop. Further along we crossed over the Waikato River and made our way up the hills to Onewhero Village, and beyond finding the Chateau name, and locating Anita the big pelican/stork guarding the letter boxes. Onwards through very pleasant countryside to Pukekawa which seems to have one closed shop and a school and a church. After finding the name of the manor house we descended the hill and over the river bridge at Mercer. There is a new bridge over the highway at Mercer which took us up into the back of Mercer Township to see areas not visible from the main road. There was the remains of a tractor on top of the hill which Bud said was the same model as one he had driven on his family farm in the 1940’s. This was a road I had not been on previously and there were great views of the surrounding countryside and the river (Waikato). Coming down we went across the railway line, along into a tunnel under the expressway, up a hill and down the other side; there were no signs to say this was a motorway entrance road anywhere, but we eventually did meet up with the motorway and proceeded as per instructions to stay on the left and exit at the Pokeno off ramp. From there it was a short run to the township where we parked off the road at the café. As we had been taking our time and looking at the scenery we were the last to arrive, but we were not eliminated, in fact when the sheets were marked we actually won. As there were only three cars (two club cars) and one modern that was not difficult, every one won a prize of a box of chocolates descending in value according to the place you came. Thanks to Janice and John for these. Those that went on this very pleasant scenic drive were Ant Kite & Karen Preston (modern), Bob & Gwen Cleland (Prefect), and ourselves Thelma & Bud Semadeni (Prefect).